Working on this project helped me develop several skills that will be useful to me in other projects. For one, we made an infographic which is an excellent tool that displays our written work with pictures and graphs. When explaining my work to our viewers, the infographic helped me show my work with graphs rather than just explaining it. Another skill I developed was not adding my bias in our written work. Not having bias is very important in science writing and I needed to make sure that it was all facts so there was no fluff. Lastly, this project helped me advance in making graphs, and collecting data. The two most significant things I experienced during this project would have to be making infographics, and working with others to create a well written piece. In this project we definitely depended on our peers in our group to do their part. Without everyone doing their work it would not be complete. So, everyone contributed by making our own infographics and adding our work to the written proportion. Although we completed the project, there was difficulties we faced getting there. Like, for example, when someone did not participate in our project, we would have to do it for them and that means twice as much the work. That was one of the few difficulties we had to overcome. Also, when we created our infographic some of us did not realize that they had to be a specific size and had to change our entire graph in order for a good outcome. As we worked through this project, there was several conceptions I learned about myself. I found myself more as a leader, and making sure everyone does their part. Another thing I observed was that I was constantly helping people making sure that the people in our group understood the concepts. Continually helping people does not bother me though, I actually love helping others. 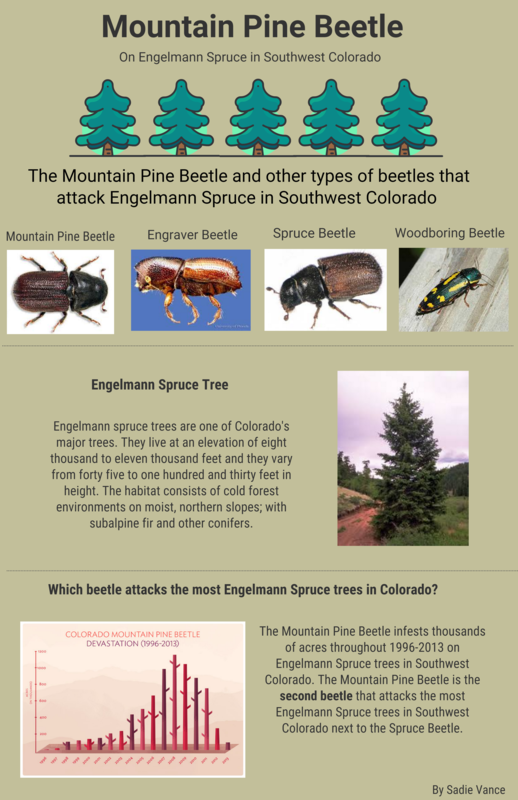 In our project, we researched about certain beetles killing Engelmann Spruce trees in Southwest Colorado and wanted to know which beetle killed the most Engelmann Spruce trees. There are millions of trees in our ecosystem in Southwest Colorado and several have fallen to beetle kill. It was interesting learning about why so many trees have died and how we can prevent it. If I could do this project again, I would have wanted to gather more information about the different kinds of beetles and how they affect Engelmann Spruce trees. Also would have liked to spend more time with my peers in our group so they understood clearly. If everyone did understand completely, we would of had a greater result. Taking on this project, increased my skills of making graphs, writing factual pieces, and collecting data. Learning these skills could help me in the future for several reasons. For example, everyone loves a good graph, and creating them can be challenging, but when you know how to they’re an excellent tool to display your work. Another ability I was able to learn was not adding bias in the writing piece, making sure there was no fluff, and having reliable facts. There will be times later in life where I will need to have the knowledge to create a unbiased factual piece. Before we began this project, I would have liked to have more experience with infographics, and writing factual pieces. This would have helped me achieve an exceptional infographic and I would not have to edit so much as I did with the written proportion making sure it was unbiased. Some activities we accomplished to prepare us for our exploit was exploring our ecosystems in Durango, Co, and researching local issues. I really liked how we went outside and got a look at ecosystem rather than just reading articles about it. For me, I remember experiences more over reading and doing worksheets.